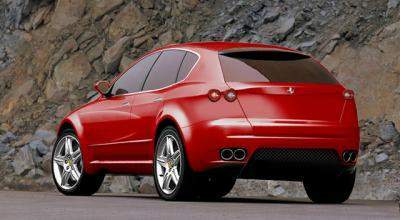 Home » Cars » A Ferrari SUV? It’s pretty interesting what Photoshop can do in skillful idle hands. 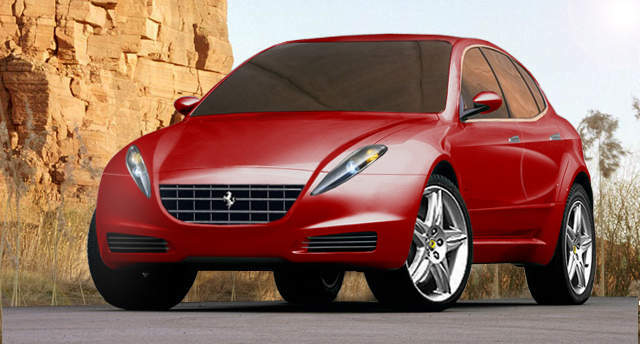 If Porsche can come up with an SUV, so can Ferrari! Will it ever come true? Very possible! Ferrari has decided to build a prototype of a SUV, but however it must prove to the Fiat Group which owns it that it is viable to produce. Ferrari is probably feeling a little jealous looking at what an SUV can do to a car company’s annual returns. Hint: Porsche Cayenne. Even Lamborghini is working on one, possibly based on the Volkswagen Touareg. Everyone is mad about SUVs, even in this time when oil prices are sky high. SUV aficionados must know something I don’t. Read on to find out what the prototype might end up looking like. I have to say… the shot of the back looks great! But the front is just plain weird. I think if the “nose” of the vehicle is lifted a little it would look much much better. Currently it’s just slanting down too much. Looks like a Volkswagen Beetle with the round lights replaced with kuaci-shaped ones! Most likely this photo is a photoshop from a Maserati Kubang SUV. Let’s see if a Ferrari SUV ever becomes a reality.